Hello Monday! How was your first weekend in 2015? I am surely savouring my last few days of #HolidaysinEurope in Athens, soaking up the bright sun rays (though not all that warm) by the Mediterranean Sea before heading back to Toronto. The slightly warmer climate reminds me of the sweet spring breeze in April with the early bloomers offering us delightful pastel colors and fresh spring fragrances. I know it's a little early to think Spring but hey, we are soon going to see Easter items hitting the stores, so why not plan ahead and brainstorm on your next home improvement project? A couple of winters ago I sat down with my dear friend since Grade 9 to chat about her new rental. It has a fantastic kitchen, a well-appointed layout, along with the classic light beige walls + vertical metal blinds. With a couple of months to plan and a couple more to shop / install, my friend's rental is not longer another typical apartment around the block. This is one beautiful story I am super excited to share with you today. Tight in square footage and with almost impossible restrictions imposed by landlord (no paint or any holes on all walls) doesn't mean you will have to live with small scale furniture pieces or in a space lacking personality. Here is how we do it in the living room. The lack of architectural details is enriched by the wealth of patterns, textures, soft delicate pastels, and an eclectic mix of styles. A timeless statement such as the glass & brass table lamp from Ralph Lauren up the elegance factor, while its juxtaposition with a sleek contemporary chrome & glass side table gives the space a modern appeal. 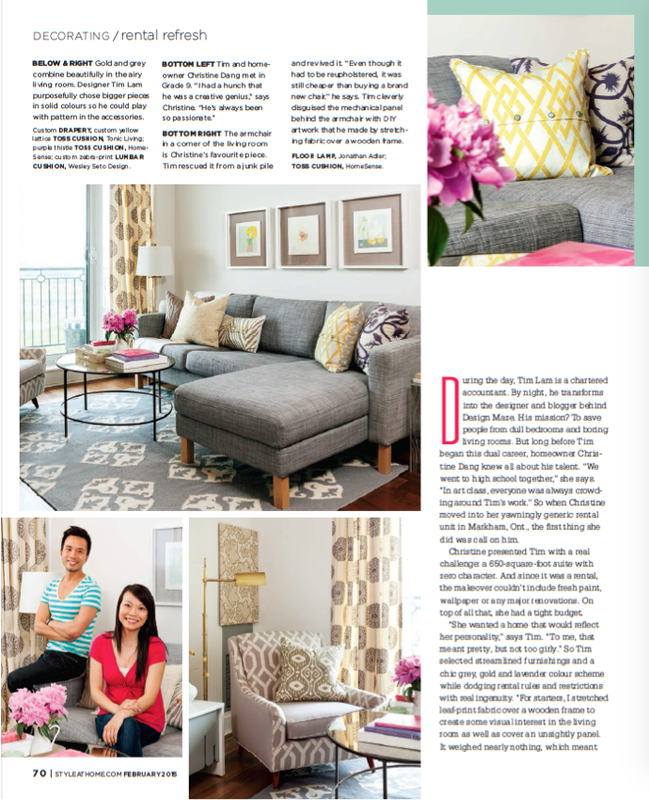 A few more shots of the living room and a big thank you to Janine of Tonic Living for the sensational drapery curtains! If you have vertical blinds at home and don't want to replace the entire system, just take down the metal blinds and have your drapery panels hook onto the same track system for an instant makeover! Who doesn't dream of a bright floor to ceiling window in the bedroom? The challenge of this fantastic feature is that it's also very difficult to find a vanity or desk in the market that fits the space. With my "make-it-happen" / "slightly obsessive" personality, I wasn't going to let the space overruled my design solution. Well, we came up with a perfect custom vanity without the expensive price tag! Another big thank you to Susan of Fine Interiors by Susan who made my off-the-shelve shower curtains into custom draperies. A extra band of striped fabrics on the side and a wider band at the bottom, we now have full length drapes (with black out lining) that function like a dream. The biggest challenge yet at this rental makeover was the dark, isolated den right off the foyer. With zero chance of nature sunlight and lack of overhead light, I knew I needed to brighten the room somehow + dress it up to wow the arriving guests. I decided to double duty the space as a home office + romantic dining for two. A pair of Jonathan Adler sconces (20 light bulbs in total) sets on dimmer offer both practical lighting for work and ambience in the evenings. 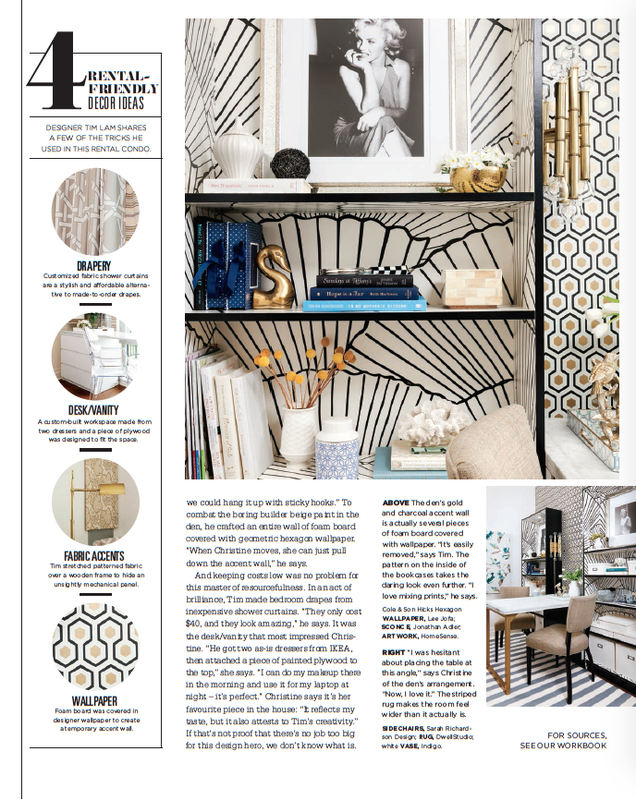 The dramatic hexagon wallpaper from Cole & Son adds luxe to a blend beige space, provides shimmers with its metallic finish, and it surely is a match made in Heaven with the PS Billy bookcase from IKEA! My design vision for the den wouldn't be possible if it wasn't for Vie of Anvil Wrought Iron Furniture who came to the rescue with her sleek and contemporary custom brushed brass table base. Adding a salvage marble top and a pair of Nik dining chairs by Sarah Richardson Design, I would say this den is ready for business! 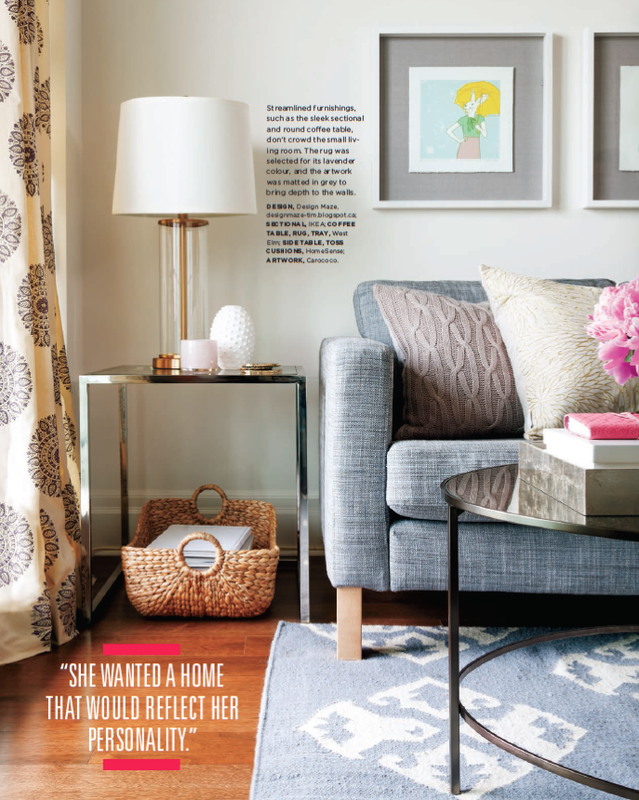 Thank you so much to the Style at Home magazine for the incredible feature and the super talented Donna Griffith who has captured the condo so beautifully! 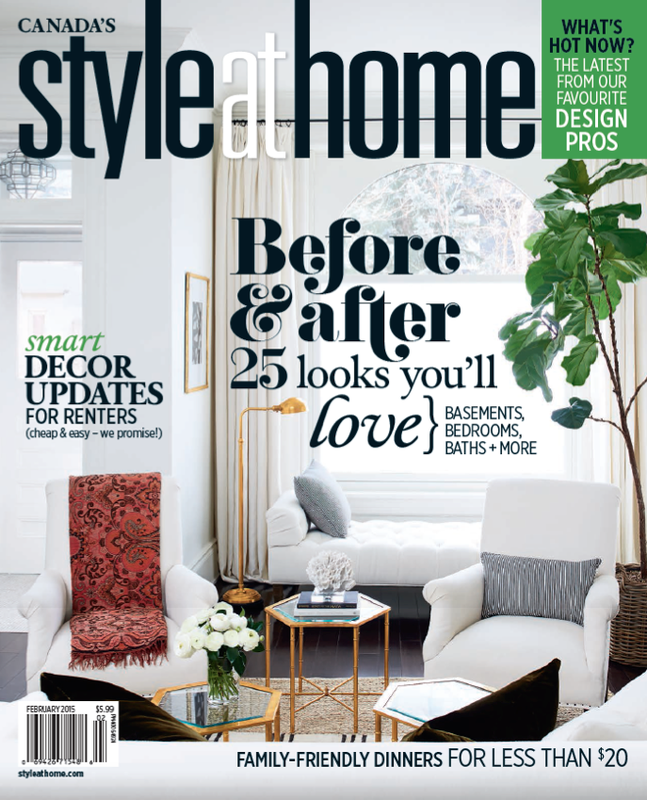 Many more inspiring before & after makeovers are featured in the February issue of Style at Home. Have you pick up your copy yet? Come back on Thursday for more behind-the-scene fun at this rental makeover + the photo shoot, along with some tips on how to tackle a rental apartment without breaking the rules or the bank! See you on Thursday! Looks fantastic and well done for getting published! It's a wonderful space, Tim. You always do such an amazing job, and you've come up with some great rental ideas!! Congratulations on the feature!! Such a great and well-deserved feature, Tim! You were so creative in your solutions for the office/dining space. Thanks Jen! Looking forward to hanging out this week at IDS! What a wonderful design! I really enjoyed the article and didn't realize that you're a CA like me. 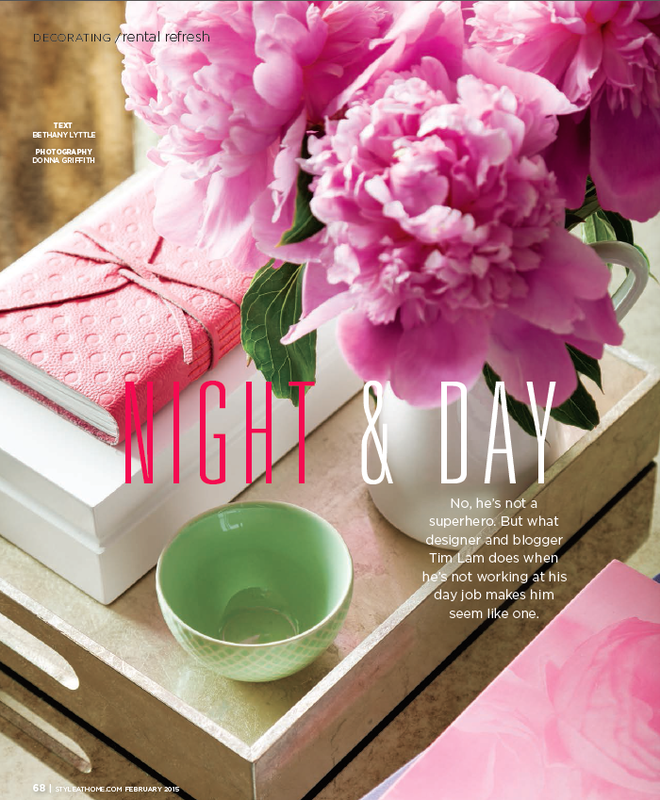 It's so great being able to work in both the corporate and design worlds. Such an amazing space Tim! Congrats on the feature! Thanks Michelle! See you at IDS?